Fairtrade events are in full swing; as well as our Fairtrade stall, so far this week we have had a display, competitions, a debate, and a treasure hunt! On Wednesday, Harvey and Jack organised a three-round Fairtrade Quiz in the Library over lunchtime, with prizes of Fairtrade Jelly Beans. 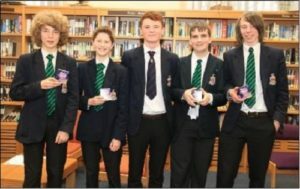 Well done to Chris, Joseph, Harvey, James and Ben, who were the winning team.